Yesterday, I wrote about John McCain's chief political advisor, Charlie Black, and his history of being a paid shill for some of the world's worst dictators. But I left one of his clients for a later post, because Jonas Savimbi truly is a special case. Those of you who were too young to be paying attention during the 1980s might not remember Jonas Savimbi and his organization, UNITA. Briefly: there had been armed resistance to Portuguese rule for years, but when Angola became independent of Portugal in 1975, a full-bore civil war broke out. It lasted, with a few short breaks, from 1975 until Savimbi's death in 2002. It started as a scramble for power after independence, heightened by the Cold War. (Apparently, declassified documents show that we intervened before the USSR and Cuba. I didn't know that.) Savimbi, who started out as a Maoist and a Portuguese agent, became one of our guys (he was also heavily supported by the apartheid government of South Africa); his main rival, the actual government of Angola, was supported by the USSR and Cuba. During the 1980s, this turned into a full-bore Cold War proxy fight. This did not have to happen. We could have let Angola be. Its government was dreadful, but Savimbi was no rose either; even if you think that we should intervene in other countries, when a country seems to have a choice between two awful options, there's no real point in choosing sides, and certainly no point in plunging a country into civil war to get your side to win. This would not have prevented civil war -- Savimbi was supported by South Africa, which had a policy of trying to bog down the states near its borders in civil wars -- but it would have meant not actively contributing to the destruction of a country for no good reason. Alternatively, we could have chosen to support Savimbi, who was even more dreadful, in a civil war. "The tap that Kissinger had turned on, and Carter had turned off, was opened again in 1981, when Ronald Reagan approved a covert aid package for Unita. South African Special Forces were good at what they did. Unita’s performance was already much improved by comparison with its half-hearted exertions against the Portuguese. Even so, Washington’s financial and diplomatic backing was an immense boost. The country, which was now a Cold War cockpit, remained undefeatable, but it could be comprehensively ruined, and this is what happened. The figures for war-related deaths, and child deaths in particular, leapt dramatically in the 1980s. Towns and villages were deserted or shelled to extinction. The countryside was a living death. There were landmines and limbless people everywhere (there still are). Young men were press-ganged into the burgeoning rabble of the Angolan Army, where the discipline of the elite units could not hope to reach. Unita kidnapped and abducted its fighters or picked up the homeless, traumatised survivors of Government offensives. Some of them were so-called ‘child soldiers’ – ‘premature adults’ is a better description. Provincial capitals became slum havens for hundreds of thousands of displaced people. Savimbi’s struggle, subsumed though it was in a large-scale offensive driven by South Africa and paid for in the United States, had come home to Angola." We did not have to make this choice. Angola's government was bad, but all-out civil war was much, much worse for the Angolan people. What Charlie Black was lobbying for, in the 1980s, was enough US assistance to allow Jonas Savimbi to mount that all-out civil war, and to destroy his country. "When Savimbi came to Washington last month to seek support for his guerrilla organization, UNITA, in its struggle against the Marxist regime in Angola, he hired Black, Manafort. What the firm achieved was quickly dubbed "Savimbi chic." Doors swung open all over town for the guerrilla leader, who was dapperly attired in a Nehru suit and ferried about in a stretch limousine. Dole had shown only general interest in Savimbi's cause until Black, the Senate majority leader's former aide, approached him on his client's behalf. Dole promptly introduced a congressional resolution backing UNITA's insurgency and sent a letter to the State Department urging that the U.S. supply it with heavy arms. The firm's fee for such services was reportedly $600,000." "With most of his war supplies provided by the U.S., Savimbi was able to pay Black, Manafort some $5 million to lobby for U.S. aid, generate favorable U.S. media coverage and gin up political support in Washington. With Black, Manafort's help, Savimbi has made at least five well-publicized trips to Washington, visiting President Reagan at the Oval Office, dining with former U.N. Ambassador Jeane Kirkpatrick and meeting with then-Vice President George Bush in 1988. Bush called Savimbi a "true patriot" and warned that cutting off Savimbi's U.S. aid would be "an immoral sellout of a loyal friend."" "He swept into Washington like a head of state, wearing a tailored Nehru suit and traveling around town in a silver stretch limo dubbed "Jonas' whale" by Washington wags. Seeking U.S. support for his 28,000-strong guerrilla army, he was formally received by Secretary of State George Shultz, Secretary of Defense Caspar Weinberger and, finally, President Reagan. With the help of a high-powered public relations firm, he appeared on Public Television's MacNeil/ Lehrer NewsHour and ABC's Nightline and Good Morning America to plead his cause against Angola's Marxist regime and their Cuban and Soviet sponsors. At a national Conservative convention in Washington, he received a cheering, whistling ovation, and former U.N. Ambassador Jeane Kirkpatrick urged the U.S. to provide him with "real helicopters, real ground-to-air missiles, real weapons." It was quite a reception for a little-known African rebel leader who has been unable to achieve power in ten years of fighting." "Mr Reagan welcomed Savimbi to the White House and talked of Unita winning "a victory that electrifies the world and brings great sympathy and assistance from other nations to those struggling for freedom"." "Jeane Kirkpatrick toasted him as "one of the few authentic heroes of our time." President Reagan described him as Angola's Abraham Lincoln." "Chester Crocker, the longest serving US assistant secretary of state, and the Reagan administration's top official for Africa described him as "one of the most talented and charismatic of leaders in modern African history"." In point of fact, Savimbi was a thug. "Mr. Savimbi personally beat to death a rival's wife and children. He also shelled civilians, sowed land mines and then bombed a Red Cross-run factory making artificial legs for victims of mines. "We have to call him Africa's classical terrorist," said Makau Mutua, a professor of law and Africa specialist. "In the history of the continent, I think he's unique because of the degree of suffering he caused without showing any remorse."" Witnesses have told Amnesty International, the human rights organization, that Mr. Savimbi has had opponents accused of being "witches" and then burned in bonfires at public rallies. One entire family, including three children aged 7 to 15, is said to have been killed this way in Jamba, Mr. Savimbi's military headquarters in southern Angola, in September 1983." "As for the Angolan rebels and their boss, Jonas Savimbi, Washington provided them with hundreds of millions in dollars and weapons in a 20-year civil war where no one bothered to count the hundreds of thousands of victims. Mr. Savimbi's brutality was legendary, but Washington considered slaughtering Marxists forgivable. Now, it seems, he has been murdering some of his own freedom fighters. While some of the deceased were members of his own tribe, they had the misfortune to be of another clan. The children of one of these unfortunates were also killed, their heads smashed against a tree." "By the end of the 1980s his proxy army, supplied and funded by the CIA and aided by numerous South African invasions, had sabotaged much of Angola. Swathes of the countryside were cut off from agriculture by minefields, mine victims and malnourished children swamped the hospitals and tens of thousands of children were also kidnapped by Unita troops and taken to Unita-controlled areas in the south around Savimbi's capital at Jamba. Appalling rites, such as public burning of women said to be witches, characterised the reign of terror in which many of Savimbi's close associates were imprisoned or killed on his orders." When I think of Abraham Lincoln, the unforgettable episode in which he killed an old ally's children by smashing their heads against a tree is always what leaps to mind, followed quickly by the famous Lincoln Witchcraft Trials And Burnings. And I think: yes, Jeane Kirkpatrick was right: a man who would do such noble deeds as these truly is an authentic hero of our times. "Savimbi's military strategy (...) was to make Angola ungovernable. His forces systematically targeted civilians and cut the economic links between city and countryside. He also eliminated internal rivals he regarded as too open to peace." "In order to instill terror in the population and to undermine confidence in the government, Savimbi ordered that food supplies be targeted, millions of land mines be laid in peasants’ fields, and transport lines be cut. As part of this destabilization effort, UNITA frequently attacked health clinics and schools, specifically terrorizing and killing medical workers and teachers. The UN estimated that Angola lost $30 billion in the war from 1980 to 1988, which was six times the country’s 1988 GDP. According to UNICEF, approximately 330,000 children died as direct and indirect results of the fighting during that period alone. 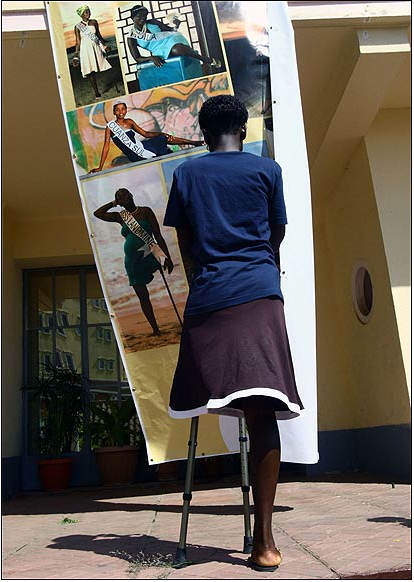 Human Rights Watch reports that because of UNITA’s indiscriminate use of landmines, there were over 15,000 amputees in Angola in 1988, ranking it alongside Afghanistan and Cambodia." Current estimates put the number of unexploded landmines in Angola at around six million, and the number of people injured by landmines at 80,000. Want to know what Charlie Black thought about this? "Black, Manafort doesn't seem troubled by allegations that Savimbi tortured and murdered his rivals within UNITA or his resumption of the civil war. While Kelly declined to respond to questions regarding the substance of the firm's contract with Savimbi, in a 1990 interview Black defended him, saying, "Now when you're in a war, trying to manage a war, when the enemy ... is no more than a couple of hours away from you at any given time, you might not run your territory according to New Hampshire town meeting rules."" "Residents of Angola's dilapidated capital, Luanda, greeted it with jubilation. People honked their horns as they drove through the rutted streets while others danced and fired shots in the air." They were cheering for the end of twenty seven years of war: a war that would have been far less lethal without American support. That was what Charlie Black was lobbying for: the support Savimbi needed to utterly destroy his country. Thanks to Black's skill as a lobbyist, and his apparent lack of a conscience, Savimbi got it. This is John McCain's chief political advisor. Think about it. And because I can't bear to end on this note, here's a picture of a girl standing outside the hall where Angola's Miss Landmine Survivor pagent will be held, looking at photos of the contestants. (The winner got a custom prosthetic limb, and some appliances.) Somehow, I found the idea of having such a contest, and the fact that it seems to have been carried off with dignity, a heartbreaking affirmation of peoples capacity to turn anything, truly anything, to good. Marry me Hilzoy. This was perfect. I know a guy who travels to an African country which I am 95% sure is Angola. He purchases a license from the official government to barter for rough diamonds on the street, I think he said the license costs $20,000/yr. He then takes the diamonds back to his place in Canada and makes them into jewelry. He’s a pretty interesting guy. According to him, DeBeers is out to get people like him because they undermine DeBeers’ dominant market position. His license is legitimately issued by what consists of the official government. DeBeers's tries to label all non-DeBeers diamonds as ‘blood diamonds’, when that is not true. He doesn’t like DeBeers. He says rural Africa is a rough place and nothing has changed there in thousands of years except the introduction of cell-phones. Savimbi got 40% of the vote in 1992 (and actually didn't loose the election, as he refused to participate in the run-off). It may look irrelevant but it does mean that at some point, a large mynority of the Angolese liked him enough, or disliked MPLA enough to actually vote for him. Sure, his behavior after the election was pure evil and he did his share of nasty thing before, but somehow conflating pre-1992 and post-2002 Savimbi and presenting UNITA as an illegetimate movement and calling MPLA "the actual government of Angola" are weird stances. Beyond that, if 40% of the Angolans were so mistaken about him, one can see why Wingnuts with a strong desire to throw money at anyone who claims to fight marxists would be too. Africa is definitely NOT my area of expertise, but I do have a question for "Random African." How certain are you that the fact that "Savimbi got 40% of the vote in 1992" actually means that "40% of the Angolans" were in favor of him? I've seen data indicating that 99% of North Koreans are (similarly) in favor of Kim Jong-Il. Significant? I hardly think so. And that query was by me, dr ngo. How is it that when I'm looking at a sentence that says "You are currently signed in as dr ngo," and I post something, it forgets who I am? Who am I, anyway? Am I my resume? By most standards, the 1992 election was open and fair. That's why Savimbi's reactions was so disgusting. And remember that he wasn't the incumbent and had been tarred by the South African association. Not at all clear what you're arguing. As the Harding article points out, Savimbi did have support; the three Angola wars were conducted so brutally that, inevitably, some sizeable minority of the government's excesses came to prefer Savimbi, and those of his own ethnicity often supported him too. How all that demonstrates that he wasn't a thug, or that he wasn't responsible for some truly horrific atrocities, or that McCain's advisor isn't responsible for giving support to one of post-independence Africa's premier thugs is lost on me. "Tis did not have to happen. We could have let Angola be. Its government was dreadful, but Savimbi was no rose either; even if you think that we should intervene in other countries, when a country seems to have a choice between two awful options, there's no real point in choosing sides, and certainly no point in plunging a country into civil war to get your side to win." It seems to me there's a conspicuous gap in your otherwise typically superb post, which is the lacuna in explaining why the U.S. government of Richard Nixon and Gerald Ford made this choice. Random roll of the dice? It looked like a good vacation spot? Savimbi's PR firms? This might be relevant, and this. Do you have one to spare? "How is it that when I'm looking at a sentence that says "You are currently signed in as dr ngo," and I post something, it forgets who I am?" Happens to me, too, every time I try to use the Typekey sign-in. Typepad is apparently just broken. Yup, my name and other fields went to blank, again. Like always. Broken. As a trivial side-note, it's interesting when one person consistently presents claims, and never supports them with data, but always "supports" them with an anecdote, and apparently considers anecdotes as sufficient from which to draw conclusions, but the person never bothers to look for, or present actual data or actual facts. Only single anecdotes are presented, as if they were grounds for drawing a conclusion. The apparent means of acquiring relevant "information," rather than mere facts, explains a lot about the conclusions consistently drawn, doesn't it? Please release my captive comment. Thanks. The point is that before 1992, few knew how much of a thug he was and/or were fooled into giving him the benefit of the doubt. Basically, having been a lobbyist for Mobutu is a lot worse. "The point is that before 1992, few knew how much of a thug he was and/or were fooled into giving him the benefit of the doubt." Funny how that was quite clear in endless articles in the Eighties, then, when plenty of us were objecting to or protesting the U.S. alignment with UNITA and Savimbi. Why is it the Clark Amendment was passed in 1976? [...] An insightful comment of Secretary Schlesinger was, that the US "might wish to encourage the disintegration of Angola. Cabinda in the clutches of Mobutu would mean far greater security of the petroleum resources." Angola is currently the second biggest trading partner in Sub-Saharan Africa of the U.S., primarily because of oil; Angola produces .0014 billion barrels (220,000 m³) of oil per day, second only to Nigeria in all of Africa. This is expected to rise to .002 billion barrels (320,000 m³) per day by 2008. But how is it that hundreds of thousands, if not millions, of Americans were protesting Savimbi and UNITA and U.S. support of them during the Eighties, when "few knew," I wonder? In the late 1980s, however, international human rights organizations accused UNITA of human rights abuses, charging that UNITA was intimidating civilians to force them to support UNITA or to withhold support for the MPLA-PT. Appalling, but hardly surprising. During the Cold War many actually believed the "better dead than Red" credo. If the Soviets supported a government, we would support any anti-government movement regardless of its bloodthirstiness. "did all of us constitute a brave, proud, few, given that the objectors were more or less identical to the set of people in the anti-apartheid movement"
This may explain that, right ? Over the next few years, the United States increased its military assistance to Somalia. In 1982, for example, equipment sales and gifts amounted to US$14.3 million; on July 24 of that year, the United States responded to an Ethiopian attack on Somalia by providing the Siad Barre regime with antitank weapons, radars, air defense guns, small arms, and ammunition. In 1983 United States military aid totaled US$21.2 million; in 1984 US$24.3 million; in 1985 US$80 million, a large amount of which included air-transpor; table 155mm M-198s; in 1986 US$40 million; and in 1987 approximately US$37.1 million. For 1981-84 United States Foreign Military Sales (FMS) to Somalia included US$57.15 million in delivered matériel, US$60 million financed with a Department of Defense guarantee, and US$1.811 million in commercial exports. During this same period, the United States trained 126 Somali military personnel under the International Military Education and Training (IMET) program. The cost of the training came to more than US$2.31 million. Somalia also participated in the United States Central Command (USCENTCOM) Operation Bright Star exercises. After the SNM launched armed attacks in northern Somalia in late May 1988, the United States provided Somalia with US$1.4 million worth of military equipment, which consisted of 1,200 M16 automatic rifles and 2 million rounds of M16 ammunition, 300,000 rounds of 30-caliber ammunition, and 500,000 rounds of 50-caliber ammunition. Additionally, the Department of Defense donated US$1 million for a 220-bed hospital, which operated in Berbera to help victims of the conflict. Eventually, we cut our ties to Savimbi. Specifically, the Bush administration publicly reversed the long Republican position of support for Savimbi and opposition to the MPLA in 2002, shortly after Savimbi's death, when he hosted Dos Santos in Washington. The groundwork was laid earlier, though. During Bush's 2000 campaign, sizable contributions were made to the Republican Party by the wife of Pierre Falcone, a French citizen who in 1998 passed money and arranged for arms transfers to the Dos Santos government in return for concessions to most of the world's oil giants. Sonia Falcone also contributed $1000 to Bush's exploratory committee in 1999. By the time of his visit with Bush, the Dos Santos government (which consists largely of Dos Santos himself and a few close friends) had become an oil-bribed dictatorship in the classic mold, and had ditched pretty much all of its early socialism. This "transition" by Dos Santos began in 1998, when Pierre Falcone, Jean-Christophe Mitterand (son of French PM Jacques), and a Russian-born Israeli, Arkadi Gaydamak, funnelled money and arms to the MPLA government in return for oil concessions to Total-FINA-Elf, Chevron, BP, Exxon, Texaco, and Phillips. Thus reinforced, the government effectively scrapped the 1994 peace treaty with Savimbi and went on an offensive against UNITA. After Savimbi was killed, the remaining leadership negotiated a new peace agreement with Dos Santos. The payments and arms shipments to Dos Santos became the subject of a scandal in France at the time Falcone was arrested in December 2000. U.S. publicity about "Angola-gate" caused the Republican Party to return $100,000 in contributions made by Sonia Falcone just before Bush's inauguration. To avoid any appearance of impropriety, of course. 't think it has to be this way. Actually, it's "son of French president, François Mitterand" and chief of the African Affair department from 1986 to 1992. Because of Elf (and complicated connexions in neighbouring Congo-Brazzaville and Gabon), France has been quite friendly to Angola long before 1998. According to an Associated Press report on October 26, 2000, the US Embassy in Luanda assisted Halliburton in securing a $68 million US Export-Import Bank loan for Angola in 1998, during the height of much of the arms running activity between dos Santos, Falcone and Gaydamak. The AP cited a cable from the US Embassy in Luanda to Secretary of State Madeleine Albright that states, "Our commercial officer literally camped out at the offices of the national oil company, petroleum ministry and central bank, unraveling snag after snag to obtain the transfer of funds ... The bottom line: thousands of American jobs and a foot in the door for Halliburton to win even bigger contracts." Cheney, a one-time supporter of UNITA, appears to have changed his mind after the former CIA-backed guerrillas were deemed a threat to US oil interests. Just another reason why I'm not particularly sorry to see all of the Clinton crowd back in the executive branch, either. Thanks for the correction about Mitterand, RA. Jacques is Chirac. Of course France had strong connections to Angola before 1998; that's what made young Mitterand of use to the plan. But the oil concessions began in 1998 -- at least for the U.S.-based majors. RA's point about early Chevron footsying with the MPLA is well-taken. The major reason any of the world's powers have been interested in Angola is Cabinda, and its oil. "Jean-Christophe Mitterand (son of French PM Jacques)"
"Sonia Falcone also contributed $1000 to Bush's exploratory committee in 1999." I'm unclear what you're suggeting the significance of this is: do you think Bush shifted policy years later for $1000? Also, there are links one could give in 2 seconds with a lot more info than writing a version that has "facts" like Francois Mitterand ever being Prime Moinister; might save time. "RA's point about early Chevron footsying with the MPLA is well-taken. The major reason any of the world's powers have been interested in Angola is Cabinda, and its oil." I sort of thought I brought that up back at 09:21 AM. The major reason any of the world's powers have been interested in Angola is Cabinda, and its oil. - if the USSR had any interest in Angolan oil, they would have gotten some of it from their allies, right ? Instead Chevron and Elf got contracts with MPLA. - if oil, which is in an northern exclave, was the issue, why put support a movement based in the South ? The reason why everyone was interested in Angola was strategic. Period. South Africa didn't want Marxists on the border of Namibia. Zaire didn't want Marxists next to its border. The US didn't want Zaire/Congo to turn any shade because it's right in the middle of Africa. And the USSR wanted the exact opposite. On some level, yes, diamonds and oil are what make anyone interested in Angola, but I think that explanation is too glib to really shed light on why consecutive US administrations were in bed with first the FNLA, and then also UNITA, going back to the early 1960s in fact. Subsequently, the MPLA became more avowedly Marxist and progressively closer to countries like Cuba, Algeria and eventually the USSR. Ultimately, as Portuguese authority collapsed, the US and China together were determined to prevent the MPLA from seizing power. Regional allies like South Africa and Zaire were very much in accord with this policy. The Nixon-Ford administrations were determined to set the terms of detente with the Soviet Union in a way that prohibited, as they saw it, communist expansion in Africa. A Democratic Congress, fearing immersion in another Vietnam, tried to clamp down on support for the FNLA/UNITA. In this way, Roberto Holden and Savimbi then become battlefields in American domestic politics. Like Chiang Kai Shek before them, and Ahmed Chalabi after them, these guys then become a cause celebre for one party or the other to assert their foreign policy convictions. As various people have pointed out, the fact that US firms were merrily drilling away in MPLA-controlled Cabinda is one of the more striking refutations of the notion that US foreign policy is determined by commercial interests. I think Angola (and also Iraq) are a lot less about oil and a lot more about the nefarious intersection of international politics with partisanship in Washington. For that reason I think you'll find it hard to find anyone (in either party) inside the beltway who has fancied themselves a foreign policy-maker without a record of succor for some slimey outfit or another. One of the reasons I like Obama is that he is associating with a fresh cohort of foreign policy types, and distancing himself from the Clinton-era goons (I being of the opinion that Clinton's foreign policy was both wrongheaded and incompetent, and his wife's pronouncements in this area seem even worse). Random African beat me to it. I would add that both Ethiopia and Angola offered naval facilities to the Soviets at a time that they were greatly expanding their deep-water fleet. I do think it was largely ideological though too, on some level the Soviets couldn't not assist self-avowed communist regimes in Africa. When the Portuguese colonial administration in Angola collapsed in 1974-75, there were three insurgent groups: MPLA (Marxist-Leninist, supported by USSR, other African liberation movements), FNLA (backed by Mobutu and the United States at his behest); and UNITA (tribal-ethnically based, supported by China, initially--Savimbi a Maoist??). During the Cold War many actually believed the "better dead than Red" credo. Some people who have posted on this blog still do. Gary: Glancing at the most recent posts while previewing saves valuable snark. No, I don't think Bush shifted policy years later for $1000. I think the shift occurred earlier, across the board: the U.S. government shifted policy to support the MPLA government starting in 1998, with the enthusiastic support of Halliburton and major oil companies. I think the Falcones' $100,000 contribution to the Republican Party in 2000 was part of cementing this relationship. It became politically safer for Bush to make this new relationship public once Savimbi was dead. I'm glad my too-simple statement occasioned byrningman's post at 2:38, because I agree with almost all of it. Sometimes it's instructive to make stupid mistakes. I started to wonder why I'd thought Mitterand and Chirac were prime ministers, so I went to wikipedia and learned about France's semi-presidential system. Very different from our own semi-presidential system, which involves having a president with only half the brains, character, and commitment required for the job. Or, alternatively, in which the president gives given half of his job over to a new fourth branch of government (without troubling to tell the rest of the country about it). No, there were more. Those three were the one the Portugese signed a peace treaty with. FLEC and the Eastern Revolt were excluded for apparently not being national groups.Which is odd since FNLA was probably even more "tribal-ethnically based" than UNITA and MPLA simply did a good job at hiding it. Sorry, I didn't mean it like that. byrningman, 'too-simple' is my own evaluation. My wife's cousin was a captain in the Brazilian army when he went to Angola for about a year as a UN peacekeeper in 1997. He had been living in Tefe in the Amazon, a place that was rife with malaria, heat, mosquitoes and snakes and that he had gotten very tired of. His time in Angola changed him significantly. The greatest risks were landmines, malaria and rebel (i.e. Savimbi) attacks. When he got back he told me that Tefe was a paradise. (He had no experience of a free press. In Turkey, you pick ideologies, and then read and believe stuff accordingly, at least if, like my friend, you've never been outside the country. In this way, he had read and believed Soviet periodicals from the Brezhnev era. Apparently, one had had an article on Angola, Socialist Paradise. I see a more central problem with this kind of lobbying. An advanced and interdependent society such as the one we live in depends on discouraging the indiscriminate murder of innocent people. Promoting excuses for anyone who slaughters innocent people erodes our necessary ability, to condemn other people who do it. Praise for Jonas Savimbi and UNITA taint any condemnation of Hezbolla with hypocrisy. "People will be thoroughly, more thoroughly, vetted and we'll make sure that that is the case." He specifically referred to the two people who were tied to Myanmar--Doug Davenport, a regional campaign director for Mid-Atlantic states, and Doug Goodyear, who was slated to run the Republican National Convention in St. Paul, Minn., this summer. Life under a dictatorship can be oppressive and onerous, and even small expressions of opposition can get you into big trouble. But you only have one big thing to fear, and it's usually possible to learn the rules of survival, and live a more or less normal life - going to work, finding romance, raising children, growing old - within those constraints. But life in a war zone with no clear front lines destroys the possibility of normalcy. Death or serious injury can come from a multitude of directions, and obtaining the bare necessities of life can be a continual challenge. It's a horror, and persons who subject others to such horrors have fully earned the right to be called war criminals. Nixon and Kissinger, Reagan and Kirkpatrick, Bush, Cheney, Rumsfeld, Wolfowitz, and Feith - all of them. Key facts: (1) Savimbi was responsible for escalating the conflict after he lost the election in 1992, at the cost of hundreds of thousands of lives (2) To finance the escalation, in the face of the MPLA's ability to rely on oil revenues, he turned to blood diamonds, parking billions (literally) offshore in Western banks -- much of which still sits there, unclaimed. (3)A major reason why apartheid ultimately fell "peacefully" in the early 1990s was that, with Cuban assistance, Savimbi and his South African/US allies got their asses handed to them in the late 1980s. So we may have Fidel to thank for saving Southern Africa from a much bloodier civil war -- at the price of keeping the psychopath Jonas Savimbi out of power. (4) The MPLA has since turned into a kleptocracy, helping its key leaders to oil and diamond revenues. Unhappily this has been perpetuated by foreign oil companies like Chevron, which refuse to "publish what they pay" the Angolan government. In many ways we continue to treat this country like a pawn in our imperial game, with dos Santos & Co. inheriting Savimbi's mantle...Of course it is romantic nonsense to have expected Reagan/Cheney & Co. to have desisted from supporting Savimbi and opposing the Cubans in this geopolitical struggle. If you want a different foreign policy, you must fundamentally reshape the interests that determine it. Anything less is a liberal pipe-dream. I would like to congratulate you for an article that is, in my opinion, highly accurate and fair. I am an Angolan citizen currently at University abroad, and am very please with the level of insight, care and fairness of your work. Also please allow me to share some of my knowledge with you. Firstly, Savimbi is regarded, by most if not all Angolans, as a terrorist and killer. As you correctly pointed out, the previously Marxist party ruling the country, the MPLA, established a harsh dictatorship were freedom was restricted. It is my belief as an Angolan who experienced the war firsthand however, that this government was by far better than anything Savimbi would have provided if given the chance to control the nation. To be honest, as the son of a white woman and a black man I would have probably been killed, since Savimbi's Unita believed such should be the fate of any white or mestizo individual living in the country. Unita was not only racist but tribalist at the time of Savimbi, and often resorted to superstition (such as the sentencing and burning of children, men and women accused of witchcraft) to manipulate and control its army and supporters. I must point out however that the Unita present today is not the Unita led by Savimbi in the past. The current leader of Unita in fact, Samakuva, split the party into two distinct factions after 1999, for he disagreed with the continuation of a pointless war and desired to truly help the country develop. It is my belief that the MPLA will win (fairly and by majority) the upcoming legislative and presidential elections. I am personally very satisfied with this. To be honest, I attempt to avoind politics, but it is undeniable that this party has helped my nation develop after the end of the war. The MPLA government will surely further help Angola into the path of prosperity, and in the future its power will be peacefully passed from the MPLA to another party. I understand I have written a lot but please understand that this is a highly sensitive and important subject for me. With Savimbi (and hence the war) finally gone, Angolans such as myself can finally see our country develop and our rights to freedom increasingly respected. Let us pray that our previous enemies (not only the US but China, Israel and South Africa) shall continue as our allies and friends forever, so that together we can improve not only our countries but the entire world. Ps: I know for a fact that although officially the US cut relations with Unita after the 1992 elections, in reality it only stopped providing the aid that allowed Savimbi to keep fighting after 1999. Obviously you never met the man, I did on mission for the Reagan Administration. It is very interesting (and one sided) that his opponents were conducting warfare on the same level (again your ignorance of Africa shows)and the conduct of such was brutal. Any election that is conducted now will of course be MPLA won after Bill Clinton sided with Debeers (wonder if there was a kick back). I have the unique position to have observed and studied Jonas as the best result for his country (unless you like christians killed in large numbers for their faith which the MPLA does to this day. It would have resulted in a Social-Democracy (the economy would not have supported western style free trade) that would have grown to a total Democracy instead of the "Strong Man" government currently in power.